In the last few days we’ve seen a couple of announcements from Apple regarding their computer range, with the much anticipated Mac Pro workstation and the ultralight Macbook Air systems seeing significant updates. 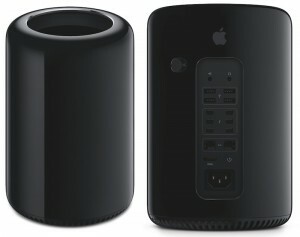 With one of the most dramatic departures from conventional design seen in many years from Apple, the new Mac Pro is a striking unit, targeting professionals seeking the utmost power, speed and flexibility. June 10, 2013—Apple® today showed a sneak peek into the future of the pro desktop with a first look at the next generation Mac Pro®. Designed around a revolutionary unified thermal core, the Mac Pro introduces a completely new pro desktop architecture and design that is optimized for performance inside and out. With next generation Xeon processors, dual workstation-class GPUs, Thunderbolt 2, PCIe-based flash storage, and ultra-fast ECC memory, the new 9.9-inch tall Mac Pro packs an amazing amount of power into an incredibly small package. Pricing is Australia is yet to be announced.